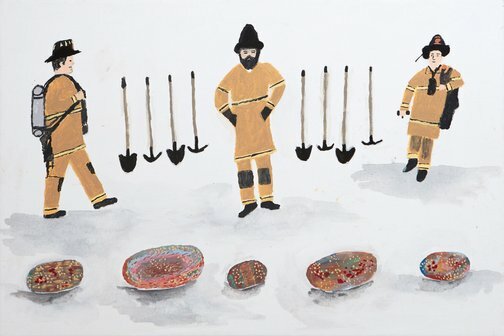 I’ve painted opal miners from Coober Pedy in South Australia, dreaming every day about finding opals in the mines. Coober Pedy is not far from my community, Indulkana. The whole town there is crazy about opal mining! Most people that live there are opal miners; white fellas own all the plots. The miners let Anangu go noodling (sifting through sandy piles left behind by miners) but no Anangu own the mines. It’s a funny place where everyone is dreaming all the time about shiny, colourful rocks.